You already have the HECRASController! 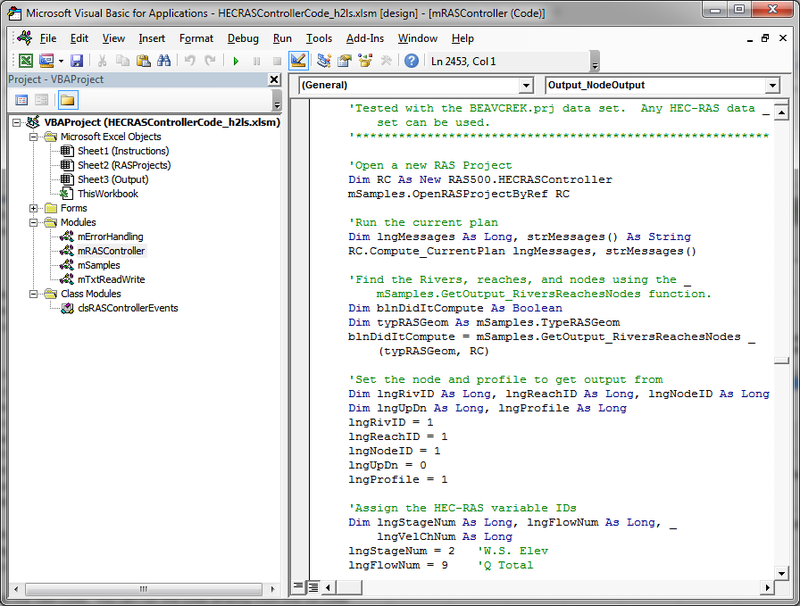 “Breaking the HEC-RAS Code” explains how the HECRASController works, provides example applications of the HECRASController, and catalogs the vast array of programming procedures (with explanations and examples on how to use them) embedded in the HECRASController. This book, along with the companion Excel Workbook, which contains VBA code for all of the HECRASController procedures will have you controlling and automating HEC-RAS in no time. 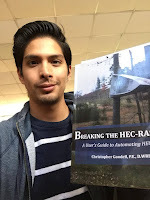 This is a "must-have" book for all HEC-RAS users. Professionals: Give yourself an edge for the next proposal and do something groundbreaking with HEC-RAS. Students: Improve your coursework, and make yourself marketable by adding the skills offered in this book. 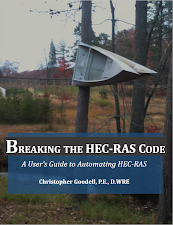 Breaking the HEC-RAS Code is now available for purchase. Get your copy here. What they saying about "Breaking the HEC-RAS Code"
"Chris Goodell’s Breaking the HEC-RAS Code is a comprehensive guide to HECRASController, a set of programming procedures that give the user control over the operation and behavior of the well-known Hydrologic Engineering Center’s River Analysis System (HEC-RAS) hydraulic modeling software. By using this book, an HEC-RAS modeler can learn to customize and automate the complete process, including opening the software, modifying data input, running the simulation, and retrieving output from the HEC-RAS binary output file. If you’ve written programs for the old HEC-2 software, predecessor to HEC-RAS, but were thwarted by the binary output secrets of HEC-RAS, you’ll be thrilled to learn the tricks using Chris’s thorough descriptions and examples based on Visual Basic for Applications (VBA). If you’ve never written programs for modifying modeling software but are eager to jump in, this is a good place to begin. Chris has done an excellent job in writing this book that is comprehensive and well thought out. While maybe not for the casual HEC-RAS user, this book will be a tremendous resource for anyone who wishes to automate and control HEC-RAS to solve complex hydraulic engineering problems." -Gary Wolff, P.E., D.WRE, Senior Hydraulic Engineer, Otak, Inc.
"I have been working with the HEC-RAS software package for over 14 years. When Chris gave me the opportunity to review his new book, I was very excited. Through his hard work, he has opened the window to utilize HEC-RAS in countless new ways and provides engineers a way to bring more value to projects and clients. I would not consider myself a programmer, but thanks to this book, I have a very good starting point and road map to use HEC-RAS in new and exciting ways." 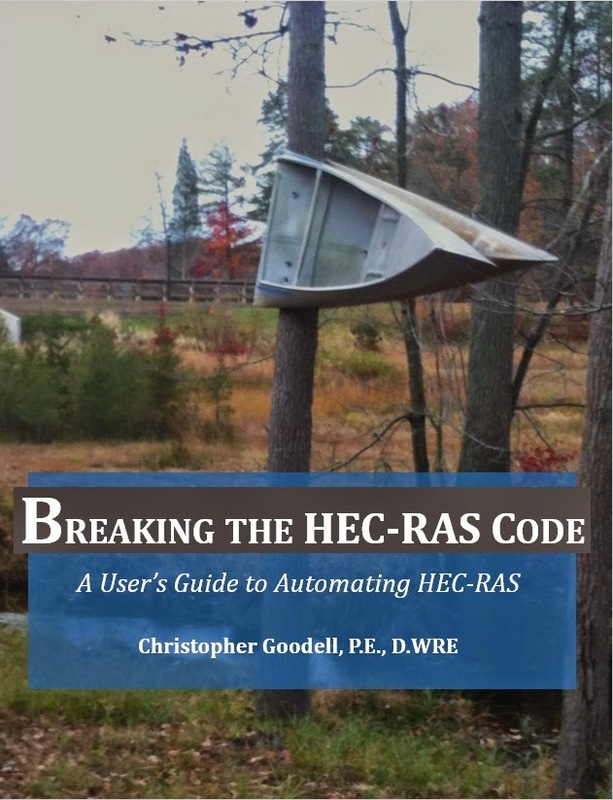 -Matt Zeve, P.E., CFM, ASCE HEC-RAS Instructor and Houston Area Manager, IEA, Inc.
"Chris Goodell’s new book Breaking the HEC-RAS Code is essential for any frequent HEC-RAS user. It provides great insights into how to most easily customize and optimize use of the code, as well as some of the program’s lesser known capabilities. When I first used HEC-2, one had to know exactly how many blank spaces to type in order to fill an eight column cell. There were no routines to debug an input data set. This book simplifies HEC-RAS and also magnifies the efficiencies of hydraulic modeling. I would expect something of this quality from Chris, who worked on the HEC-RAS Development Team and is an internationally-recognized expert in the intricacies of HEC-RAS." "I just wanted to let you know that I have been enjoying reading and using your book. I received my copy late last week and the fact that I enjoy most about it is that; it is well written and presented in an easily understandable manner. I can't wait to start writing my own code and conduct my own experiments. We have various situations here in the State, where we could utilize some of the techniques that you presented in the book." -Mandar Nangare, M.S., CFM, North Dakota State Water Commission. "Awesome Book! If you work with HEC-RAS get this book, I can 't say it any plainer than that. Even if you do not know much about VBA code the explanations by the author are clear and complete. I am using it to write some custom forms for model reviews and not once did I have that "ok, but how do you do the middle step?" problem, nothing is left out. There are many examples that you can take from the book verbatum and just modify a couple of lines to get the input or output variable you want for a form. The HEC-RAS wisdom in this book is worth a lot more than the price, costs less than one hour of an engineer's billable time, but will save many hours with automated procedures. I have only a little vba programming experience and did not have any issues with learning and using the examples and modifying them. The explanation of how HEC-RAS handles data was great! If you use HEC-RAS and don't get the book at the very least be sure to check out The RAS Solution Blog, I have found a lot of tips and tricks and just plain wisdom there." -Richard T. Smith, P.E., Floodplain Specialist, Boulder County Trnasportation Department. Thanks to all who have found these "errata" and took the time to let me know. 2. Pages 38 and 43. The function GetCurrentPlanName is called in the subroutines written on these two pages. The GetCurrentPlanName code is NOT a RASController procedure and is not presented anywhere in the book. This is code I've written myself to retrieve the current plan name title for a RAS Project. I've included the VBA code for GetCurrentPlanName at then end of this Errata Sheet. You should be able to copy and paste it right into your VBA module. 3. Page 86. A few corrections to the subroutine WriteRiversReachesNodes(). a. zOpenRASProjectByRef should be OpenRASProjectByRef. b. Dim typRASGeometry As mRASController.TypeRASGeom should be Dim typRASGeometry As TypeRASGeom. 4. Pages 96-97. A few corrections to the subroutine MonteCarloNValues(). a. Dim typGeom As mSamples.TypeRASGeom should be Dim typGeom As TypeRASGeom. Just remove the "mSamples." b. Under the comment 'Define variables used in the For-Next Loop, intNumMessages should be lngNumMessages. The same change should be made under the comment 'Compute the HEC-RAS project. c. The function GetRandomNormal is referenced towards the bottom of page 96, but is not included in the book. I've included this function below. file. Requires HECRASController as a parameter. 'Determine the current plan name. ignore the 2nd Number (y2). 5. Pages 38. The function GetCurrentPlanName is referenced in the code on this page, but is not included in the book. I've included this function below.